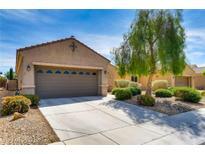 Below you can view all the homes for sale in the Stallion Mountain Estates subdivision located in Las Vegas Nevada. Listings in Stallion Mountain Estates are updated daily from data we receive from the Las Vegas multiple listing service. To learn more about any of these homes or to receive custom notifications when a new property is listed for sale in Stallion Mountain Estates, give us a call at 702-323-5986. Stone Facade, Stuccoed Covered Patio With Low Maintenance Desert Landscaping. MLS#2088908. THE Brokerage A RE Firm. Great sized backyard with a covered patio. MLS#2086636. Huntington & Ellis, A Real Est. Separate spare bedroom wing w/bath. New hot water heater. MLS#2085231. BHHS Nevada Properties. Upgrades galore. ALL furniture is negotiable. MLS#2081947. Resolution Realty. Stallion Mountain Estates ~ Country Club living in a Guard Gated Golf Community ~ Award winning single story Pulte floorplan ~ 3 Bedrooms & 2 Full Baths ~ 18x18 ceramic tile flooring ~ Tons of upgrades ~ Fully landscaped backyard with stucco'd patio cover ~Crown molding throughout ~ Large media niche in great room ~ Custom closets ~ Granite kitchen with maple raised panel cabinetry ~ Immaculate! MLS#2081449. Platinum R.E. Professionals. Wonderful Clubhouse With Many Amenities Including Outdoor Pool & Fitness Room Plus Much More! MLS#2081456. Realty ONE Group, Inc. Cozy breakfast Nook access to Front Patio.Tiled Great Rm access to low Maintenance full pavers backyard Covered Patio w/Ceiling Fan outdoor entertaining Gazebo.Was Appraised at listed price. Few miles from Airport. MLS#2079735. City Villa Realty & Management. Split floor plan with Bed 2 and 3 having their own Full Baths! Bed2/3 also have seating areas. MLS#2076442. Keller Williams Realty SW.
Come and see, this will not last. MLS#2071361. Century 21 Consolidated. W/ An Open Concept~chef Style Kit~breakfast Bar~granite Counters~cabinets Galore~tile Floors~wood Shutters~separate Mstr~walk In Closet~covered Patio~over Sized Corner Lot 13,068 Sqft. & More MLS#2071655. Century 21 Americana. Small Court Yard In The Front. Must See. 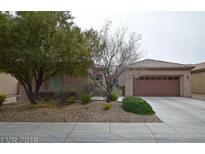 MLS#2070922. Genesis Realty Group. Pulte*all single-story*guard gated*non-age restricted*corner lot*no one behind*great room plan w/9' ceilings, surround sound, staggered tile flooring, kitchen w/granite, SS appliances, staggered cabinets, pantry, brkfst bar*Mstr bdrm separate w/bay window plus 12' walk-in closet*Mstr bath w/dbl sinks, separate tub& shower*covered patio for outdoor entertaining w/wonderful landscaping*stuccoed eves, low e windows, blown insulation*ALL APPLIANCES MLS#2070695. Keller Williams Realty Las Vegas. The Solera Community Center is within 2 Blocks Walk of the home which gives you access to a Resort Like Lifestyle, Amenities include Golf, Tennis, Pool Spa, Fitness Room, BBQ Area & Walking Trails. MLS#2069896. Signature Real Estate Group. Community Social Calendars With Nightly Activities To Include Bocce Ball, Tennis And Pickelball MLS#2061567. Realty ONE Group, Inc.
New Air Conditioner, New Water Heater, Reverse Osmosis, Pull Down Stairs & Epoxy Flooring In Garage, & More! Must See! MLS#2050760. Realty ONE Group, Inc.
Large corner lot **Price reduced over $5,000. Please show and sell. MLS#2043709. Realty Executives In Action.